Summertime is holiday time and while Danes don't head the list of countries with the most paid days off [that's Finland], they do lead the list of citizens who actually use their paid days off. If that makes sense. Whatever. Here's one way of doing it, Copenhagen style. 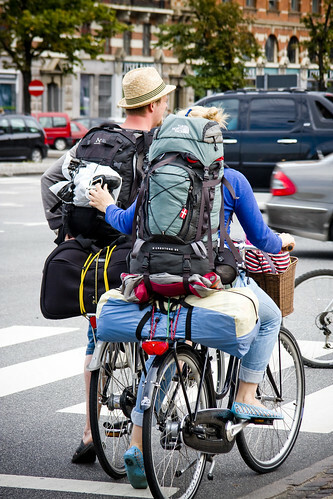 Cycle touring for regular people. Or just a cheap camping holiday. Couldn't figure out if their were coming or going. Their gear looks properly packed as though they are heading out rather than coming home. Perhaps they were off to the central station [turn right at three stoplights from this spot] to hop on a train somewhere. Whatever the case, I hope they had a lovely time.